Mairi is the new wife of Alec MacNeil, the chief of the MacNeils of Barra Isle, an island off the western coast of Scotland. Cinnia and Weylyn are Alec’s young children from his first marriage. Kenneth and Ian are Alec’s best friends. 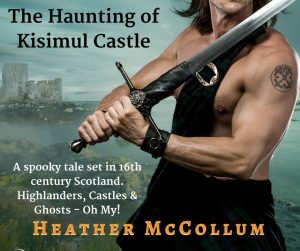 Alec MacNeil grew up in Kisimul Castle, a medieval castle built on a small island in the bay just off the coast of Barra Isle. 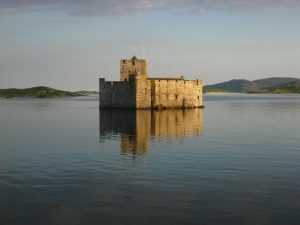 Each person living in the castle had a personal row boat to use to get them across to Barra. 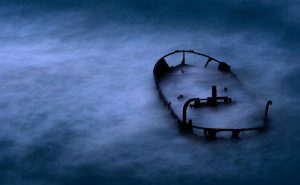 If that person died, the boat was never used again, but was left as a reminder of them. Alec watched his father lead troops away from Barra when he was a boy, never to return to Kisimul. Alec watched his mother row away when he was sixteen, leaving her son to go to Iona to become a nun. Alec watched the woman he thinks of as his grandmother row away to live on Barra because she felt trapped at Kisimul. And then Alec’s first wife rowed away to the mainland, in secrecy, and was murdered. Yet Alec dutifully remained living in the castle, a symbol of the strength of their clan. 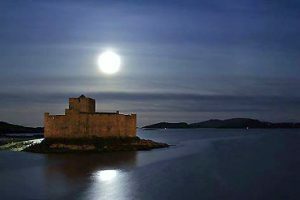 At the end of THE WOLF OF KISIMUL CASTLE, Mairi and Alec, with his two children and pack of dogs, are living on the mainland of Barra Island. Kisimul is left abandoned, sitting in the bay alone, once the unbroachable seat of The MacNeil of Barra Island. And now, the start of the tale! Alec MacNeil unfolded from the fur-topped bed with slow, even movements so as not to wake his thoroughly sated bride, Mairi, her siren’s curls strewn across her pillow. Her touch was a balm to everything that ailed him. As he left her side, the hollowness in his chest returned. He padded over to the shuttered window of their bedchamber. The scent of fresh wood still clung to the new home that he and his two friends had just built on the Isle of Barra where Alec was chief of the MacNeil clan. Pressing open the wooden shutters, Alec leaned his arm over his head against the frame. He sucked in the cool autumn air as if it were water and he was dying of thirst. He stared over the knoll toward the bulk of Kisimul Castle, where it sat in the bay. Empty. Alone and ruined. It had housed the mighty MacNeil warriors and clan chiefs for hundreds of years, and he’d been raised within its walls. Yet here he stood, apart, leaving it for the comfort of a fresh home and the arms of a loving lass. Everyone leaves Kisimul. The hollow gnawing feeling ate at the inside of his chest. Under the nearly full moon, the shape looked like a jagged mountain, stabbing up from the sea. The mist moved over the surface of the bay to wrap around the base of the small island that held the ancient fortress. It was October, and already the north wind blew in off the Atlantic, biting against his skin. His breath jammed in his chest, and he blinked to clear his eyes. His arm came down, and he gripped the window frame. What the bloody hell? A light? Along the castle roofline? Glancing upward at the clear sky for lightning that wasn’t there, Alec returned his gaze to the spot on the abandoned castle. Was he growing daft, or had he just seen candlelight where only desertion lit Kisimul with inky, black shadows? “Impossible,” he murmured, scratching along his brow as he stared at the once-again dark castle. His men had searched the entire fortress and grounds to make certain no one remained behind after the raid. 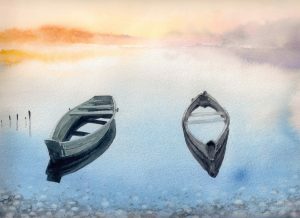 All of the small rowboats had been burned. Alec could plainly see the two small boats, which had been rebuilt, tied to the dock along Barra’s shore. No one had taken one to explore the deserted castle. He watched the walkway that ran the length of the roofline, his breath strung up as if noosed in his chest. Bloody hell! Candlelight, a yellow glow. Heart thumping, a chill razed the skin along his nape to run, straight as a blade, down his spine. Feeling the ache of clenched teeth, he opened his jaw and flexed his fingers, wanting the hilt of his sword. He squeezed his lids shut and blinked, but the candlelight remained. The roof-walk wall was high, coming nearly to his chest when he stood behind it up there. 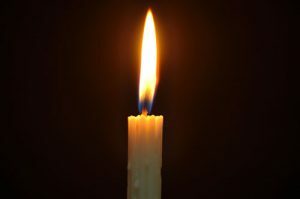 The glow of a candle flickered where he’d stood a thousand times, surveying his island and aye, praying, for those who’d left to return to Kisimul. He glanced to Mairi, his attention snagged by the beauty of her lush, naked breasts, which had come out to rest on top of the furs. Married for three months now, they still hungered for each other daily. “Is something amiss?” she asked, her hair tumbling free over one silky shoulder. Alec looked toward the dark shape of Kisimul again, but the light was gone, the castle in complete darkness. A trick of the moon. He rubbed at the tension running across his forehead. Mairi rolled from the warm nest around her to the other side of the bed. The linen no longer held Alec’s heat, and she frowned, cracking her eyes open. Alec was up and out already. She stretched and saw the bright sun coming through the crack in the shutter. Had love turned her lazy or…? She slid her hand across her abdomen, her lips relaxing into a smile. If her absent women’s cycle was to be believed, she had a very good reason for being exhausted. Queasy, tired, sensitive, and peeing like a whiskey-drinking fool, Mairi was fairly certain that she was expecting her first bairn. Mairi let her smile broaden as her hand cupped her gently rounding middle, her heart flipping with the lightness of joy. How should she tell Alec? With her abduction, healing, wedding, and building their new house, both she and Alec had been too busy for a proper courting. Life had become incredibly full when she wed and became the mother of Alec’s two spirited children, Weylyn and Cinnia. Och, they needed time alone, away, somewhere she could tell Alec about their bairn in a special way, a fun, unhurried way. Her mighty husband had been born in Kisimul Castle, and she’d caught him staring at it often since they’d left it. Perhaps she should tell him there within its mighty walls, a place he loved. Aye, it would be perfect. They could row out together for a picnic and romp without worrying about keeping quiet or being interrupted. She could tell him on the roofline under the stars. Pulling on her skirts, bodice and sleeves, Mairi opened the door to her room and headed down the second-floor hallway to the steps leading to the living area. “Bessy, can ye help me tighten my stays?” she asked. Bessy Cameron, Mairi’s friend and helper in the house, pushed up from her seat at the table. “Sleeping in again?” she asked with a small smile. Once as quiet as a frightened mouse, Bessy had opened up over the last three months of living with the MacNeils, to the point she could tease Mairi about staying up into the night with her new husband. “Alec snores. Keeps me awake.” Mairi drew out a yawn that started out fake but turned real. Bessy rolled her eyes and made a turn-around signal with her finger, prompting Mairi to present her back. Good, thought Mairi. Then she and Alec would be truly alone. “Not unless ye’re dead,” Weylyn said in an ominous voice. “Enough,” Alec said from the doorway as he walked inside. Mairi studied his frown. He was worrying about something. 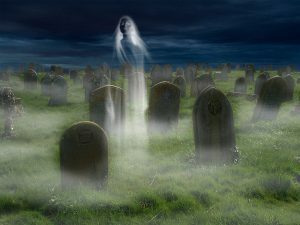 “No one is dying or sitting in the graveyard tomorrow eve,” Alec said as if his dictate could keep the specter of death from bothering his family. Weylyn didn’t seem bothered by his father’s gruff voice. “We should set out a bowl for Mama this year, in case she comes to visit.” This would be the first Eve of All Saints’ Day since the children’s mother died. Most families set out bowls and food for their loved ones who had passed on. For the Eve of All Saints’ Day was thought to be the night that the dead could walk the earth. Bonfires were lit to ward off evil spirits, but loved ones were welcome. “My family, back on the Isle of Mull, used to set out sweets for my father,” Mairi said, watching Alec. “We are not setting out anything for the dead,” he said and took up his mug of ale. Ruggedly handsome, as large and powerful as a moving mountain, Alec MacNeil wasn’t afraid of anything, let alone spirits. Alec trudged down the darkening hill toward the village along the coast. Hearth smoke wafted up out of cottages, and the town center was empty. Only two small boats sat tied at the dock where there used to be many. But they’d been burned the night Kisimul and Barra were attacked. With a castle in the middle of the bay, small row boats had been used to ferry individuals back and forth. His father had a boat that he’d rowed off Kisimul when Alec was a lad. He remembered the morning like a nightmare, the mist snaking around as if it were a serpent following his da, ready to strike. When Alasdair McNeil didn’t return, his rowboat was kept, rotting along the dock at Barra. No one would use a dead man’s boat. Now the boat lay on the bottom of the bay. The wind blew, and he welcomed the bite. It cleared the heat from his head as he breathed in the familiar sea air. He stared out toward the hulking shape of Kisimul. A patch of gooseflesh started at the base of his neck between his shoulders, spreading as warrior energy shot through his muscles, making his hands fist. For as he watched the dark bulk of the castle, the glow of a candle brightened an upper window. “Impossible,” he said, the word as hushed as his breath. He blinked, but it remained, its yellow hue a beacon surrounded by inky blackness. He rubbed a hand down his face, looking once again at the light that still flickered across the bay. His breath held half way up his throat as he watched the light move to another window, disappearing to return along the rooftop. Alec MacNeil… The voice floated to him like mist on the water’s surface. “What?” he yelled, his voice cleaving the stillness. He rubbed his eyes, but the light remained. “What?” he asked again, his voice softer. “So ye say that ye’ve check Kisimul, all the rooms and the grounds?” Alec asked Ian as the man sat, lifting his once broken leg, which he exercised with a bag of grain. 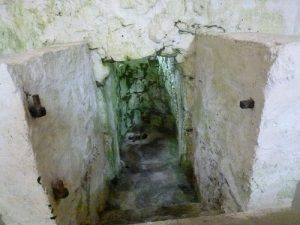 “Even the well?” The fresh water well in the center of the castle had often been suspected by the superstitious as a gateway to hell. Ian stood, bending his knee. He reached for the strong cane that had become his constant companion over the weeks of healing and strength building. “Has anyone else seen a light out there?” Alec asked. Or was he the only one allowing himself to be tricked by the moonlight? He handed Ian a flask of weak ale. “Even in the middle of the night?” Ian’s frown turned into a half grin. Bloody hell, aye. He was lucky. Alec’s life had been turned upside down when he’d sought revenge for his first wife’s death, but once he’d kissed Mairi Maclean, the shattered world began to fall into place. The only thing that remained was the sharpness of guilt that twisted in his middle when he spied his family’s castle, alone and abandoned out in the sea. 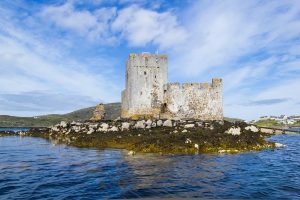 The Wolf of Kisimul Castle was the chief of the MacNeils, and his home had always been the unbroachable castle in the middle of the bay. Yet, he’d turned away from it. And now, it seemed, he was either losing his mind or the castle wanted him back. “There will be a bonfire in the town center,” Cinnia said as she rolled the pastry dough thin on the wooden side board. Mairi loved exploring new tastes baked into tarts with Alec’s daughter. The two of them had spent the whole afternoon mixing, rolling and baking for the festivities tomorrow to celebrate the harvest. “Oh?” Mairi said. Mairi knew the customs of All Saints Eve from growing up at Aros Castle on the Isle of Mull, but Weylyn and Cinnia were new to them. It was their first autumn away from Kisimul Castle. Mairi patted the girl’s shoulder. “I’m planning to take your father away that evening, just the two of us. Millie will be here to watch out for you and Weylyn, so if she’s fine with putting out dishes, then your father will never even know.” And then Mairi could speak to him about his children’s need to remember and honor the dead. Mairi kissed the girl’s forehead and walked outside the kitchen to catch the cool fall breeze. The nausea that had plagued her for weeks had lessened, and she gave thanks for not having to hide it any longer. Feigning interest was difficult when one just wanted to curl into a ball or rush out the door to vomit. Mairi inhaled the light tang of hearth fires wafting up from the village below the rise where Alec had built their family home. She held a hand to shield her eyes from the unobscured sun and looked to the bay where Kisimul sat, a grey fortress against the blue sky. A shiver slid along her nape as she stared at the roofline where she had once traipsed as a well-treated prisoner. She’d lived there, out in the bay, even down in the dark dungeon, and had felt safe. Yet now in ruins, Kisimul looked … sinister. Alec helped Mairi step into the trim row boat that Kenneth had rebuilt for him and handed her the basket of food that she’d brought. Alec had only used the boat to ferry out to his galleons over the last few months. Was he avoiding Kisimul after having grown up surrounded by its strong walls? The words he’d heard echoing in the night, sat heavy in his mind as he pushed off from the dock. It had been a bloody trick of the mind, spurred by his guilt for not living where the chief of the MacNeils was expected to live. “Are ye certain ye want to go back over to Kisimul for our picnic?” he asked Mairi once again. “I would argue that was on the rise where our home sits,” he said, reminding her of their first night loving each other under the stars. 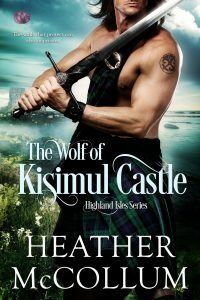 He watched Mairi adjust her wool plaid to shield her from the wind pressing them forward toward the castle. She looked inside the wide basket and then settled into her seat, hands propped beside her hips. His muscles flexed as he rowed, and the wind felt good in his face. Perhaps it was a good idea to leave Barra during the All Saints Eve festivities. Mairi seemed anxious to get them alone, and he couldn’t think of a better way to spend the afternoon and evening. “We could just pull up to the Sea Rose and picnic on the deck,” he suggested, but Mairi shook her head. “Ye aren’t afraid of cursed Kisimul, are ye?” she teased. “Well, I’ll do my best to soothe your ire, sir,” she said with a heated leer. “Hmmm… perhaps we should visit that dungeon cell of yours,” he said, his eyebrows reaching high. “I think I prefer out under the stars,” she said with a knowing grin. Alec rowed the small boat up to the wooden dock that stuck out from the rocky ground surrounding Kisimul. His stomach tight, he stepped off and tied the rope to an iron loop set in the stones. What ailed him? This was his home for most of his life, not a waiting ambush. Alec reached for Mairi, and she took his hand, the warmth of her palm against his. Her smile faltered as she surveyed the castle behind him. “Ye aren’t feeling ill from the crossing, are ye?” he asked, looking over his shoulder at the increasing shadows. Without knowing that his family lived within the walls, the castle felt more like a tomb. Cold, dark and without breath. ‘Tis must be what had tripped his warrior’s instincts, making his pulse pound. “Ye were the one who wanted to come.” He smiled, hoping to break the tension as they walked toward the bulk, silhouetted against the water. 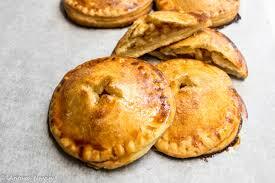 He’d had Kenneth come across earlier in the day, with several of the men, to make certain no one had taken refuge in the ruin, but they hadn’t found anyone, not even a rodent in the flour that had been left. Alec found the flint and torch that his men had left for him. 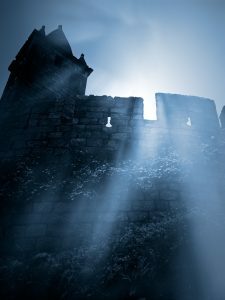 With the fire brandished before them, they walked through the gate in the thick, stone wall into the courtyard before the keep. The doors of the buildings were shut tightly, several with black scorch marks scarring them. He wrapped his arm around her shoulders as they entered the keep, the air still filled with the tang of smoke. The room was completely dark and empty except for rushes on the floor and a few half-burned rugs. Half-melted candles stood in the chandelier above them, and he lifted his torch to light three, illuminating the great hall. “Let us avoid the well room,” Mairi said and shivered. “Agreed.” He escorted her to the short flight of stairs that led up to the second level and then up another flight to the rooftop. Alec pushed through the door and breathed deeply of the clean, night air. Bloody hell, he’d been holding his breath like a frightened child. Curses were just evil wishes and not something that could harm. And ghosts did not walk the earth, even on All Saint’s Eve. Alec kept Mairi’s hand as they ascended to the roof walk. Bam. The door slammed shut, making Mairi gasp. She spun around and then looked back out toward Barra Isle. “Look,” she called, pointing. Alec followed Mairi’s gaze out over the stone wall that guarded them from plunging to the bailey below. Fire soared up into the night in the village square. Heart jumping high into his throat, Alec’s hand moved, without thought, to his sword. Another raid? Mairi found his hand in the darkness. The feel of her fingers, intertwining with his, made him glance down. 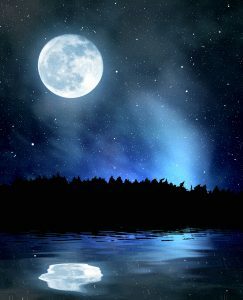 Her face was lit by the moon that watched as clouds skittered across the night sky. Ahh, his Mairi. He touched her cheek. How had he become so fortunate as to find a woman like her? He leaned his hands on the wall ledge and stared out at the fire. It was a beacon in the inky night. Mairi wrapped her arm around his waist, leaning into him. Her softness and strength, a miraculous dichotomy that soothed his anger. “Will ye set a plate for me when I’m gone?” he asked. “Ye siren,” he said, pulling her closer, his hands catching in her loose curls. He bent toward her, craving the taste of his woman, his luscious bride. The kiss grew instantly carnal. Mairi wrapped her hands behind his neck pulling her into him, slanting her face to his so that their lips met with wild, unbound passion. His fingers deftly worked to untie the lacings of her cinched bodice, releasing it so that she could shrug until her soft, pale breasts rose into view. Alec’s mouth moved to her ear, kissing a trail down her fragrant neck. She smelled of flowers and warm, delicious Mairi. The coolness of the night breeze wafted across his arse as she lifted his kilt, her exploring hands working their magic. “Och, Mairi lass,” he whispered at her ear, his brogue thick with want. “Aye?” Her voice rasped on a moan as he cupped one breast. “Ye have a wonderful way of planning our picnics.” And his lips followed his hands down her body. Mairi twirled a short wave of Alec’s hair around her finger. His head lay on her barely covered breast, over her heart. “It’s a lovely, strong sound,” he said, pushing up onto his elbows, shifting over her to kiss her well-loved mouth. She laughed lightly, keeping her secret inside a bit longer. They held one another upon several thick blankets that Alec had laid down across the stone walkway, so they could love each other once again under the stars. She’d thrown her smock back on to guard against the cold, and it cinched up around her hips. Her toes curled into the light hair on his shins. “Actually, I have a gift for ye,” Mairi said and folded upward into a cross-legged seat. She reached into the food hamper, searching blindly under the cloth napkin at the bottom. Alec righted himself across from her, his large, warm hand landing with tantalizing familiarity on her naked thigh. “A gift? “Aye, your favorite dessert,” she said, handing him the specially made tart. “Ye are my favorite dessert,” he said, taking it. He leaned in to give her a long, unhurried kiss. He smiled, his brows lowering in confusion. With the moon so full above them, his face looked silver and magnificent, like one of the star constellations come to life. “Be careful,” she said, grinning. “Have ye created something new?” he asked and took a bite, his teeth stopping on something. “We both have,” she said with a chuckle. “A little nut baked inside your sweet,” she said, smiling broadly over her cryptic clue. “Well…Thank ye.” His grin was heavy with confusion. Mairi doubled over with laughter. “What?” Alec asked, laughing too. “The sweet is me,” she said, pointing to herself. 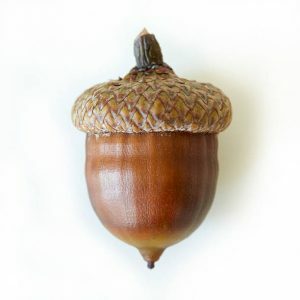 “And the little nut is …” She pointed to her slightly rounded abdomen. Understanding hit Alec, driving the breath right out of him. The little nut fell from his fingers. Mind suddenly blank, Alec leapt into a crouch to look for the little nut, making Mairi shake with joyful laughter. Mairi slowly nodded her head. Without a thought, he scooped her up under her arms while she squeaked, and swung her around in his arms. “Whoop!” Setting her feet down, Alec cupped her beautiful, moon-painted face in his hands and kissed her soundly. They held each other for a long moment, until he heard her smother a yawn. “Ye must be exhausted,” he said, taking her hand. He bent to grab up the blankets and her outer gown. Alec helped her dress and tucked her into his side as they walked to the wall surrounding the walkway. Mairi gasped. “Bloody hell,” Alec said, his voice just a whisper as they both froze, looking toward the water around the small island holding Kisimul out of the cold, dark water of the bay. Though the sky directly above them was clear, a thick fog had snaked in to surround the island, cutting them off from the mainland. Even the bonfire on Barra was just a muted glow in the strange mist. “There’s only one dock at the front of Kisimul.” And he’d tied the boat into the iron loop. Had someone untied the rowboat, stranding them on Kisimul? He grabbed her hand, setting the food hamper down to unsheathe his sword. “Come along,” he said, and they rushed into the keep. The darkness enveloped them inside without the glow of the full moon overhead. 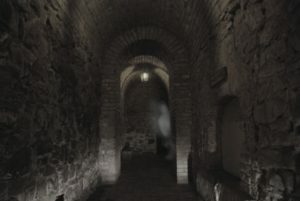 “Be careful,” he warned as they took the steps, feeling their way down into the ruined great hall. He lowered his voice. “Someone may be hiding in wait.” Heat poured through his veins as he pulled Mairi into his one side, sword brandished before them. Let the arse show himself. He would slice the villain in two for scaring Mairi. But no one blocked the way, and they ran out into the silvery court yard. “I can’t believe how clear it is overhead,” Mairi whispered as they rushed through the open stone gate. Their boots sounded hollow as they hit upon the wooden boards of the dock and stopped. Mairi breathed hard to catch her breath, and the water gently lapped against the shore. Otherwise, no noise penetrated the thickness of the fog. “I don’t even hear the celebration across the water,” she whispered, and he felt her tremble against him. 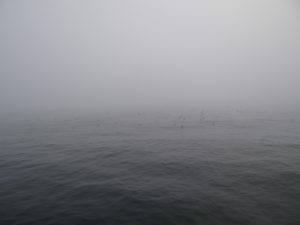 Alec clutched his sword, thrusting Mairi behind him, as he watched the row boat emerge from the mist. The sound of oars hitting the surface of the water, came across on the breeze. He would argue, but his attention was fastened on the boat that was gliding closer. He could see the side of its hull. Holes of decay, pealing white paint. Alec’s lungs held tightly to his quick inhale as he recognized his father’s boat, the one he’d sunk to the bottom of the bay. The name wafted in with the increasing breeze. “Bloody hell, Alec,” Mairi said, yanking his arm to make him retreat with her toward the castle. She nodded, her eyes wide with worry. Her fear pierced him, and he stepped with her up the dock to the gate of Kisimul. 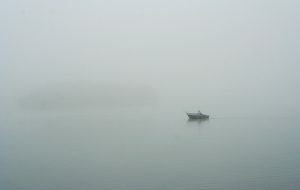 When he turned back, the ghost boat was lost again in the mist. Blast, his name seemed to come from the shifting fog. He let Mairi pull him into the courtyard. “Back to the roof,” she said, tugging him along. Aye, his bride was a warrior at heart and knew that the higher ground was usually the safest place to be, as long as one wasn’t surrounded by fire. But he’d never fought against… whatever this was. A voice in the mist? A phantom boat? Spirits? Chill bumps rose up the skin of his back. How could he protect Mairi from something he may not be able to kill? He swore under his breath and trudged with Mairi through the keep. The candles he’d lit in the chandelier above them sent shadows around the empty room, a room that had always been familiar but now looked sinister. Heart pounding, Alec steadied Mairi’s arm as they broached the roof, pushing out through the heavy door into the cool air. “I was afraid the door would be barred,” Mairi said, catching her breath, a hand to her heart. He shook his head. “That has happened before,” he said, trying to calm her. The voice lifted up from the docks beyond the wall where he could see his father’s boat, tethered and empty. Aye, it had. Last night, from the dock at Barra. But he’d thought it was just his guilt plaguing him for abandoning his ancestral home. All Saints’ Eve, the night the dead walk the earth. At present, the myths and childhood tales didn’t seem to be merely fantasy devised to make the weak of heart jump and gasp. Alec clasped Mairi’s hand and tugged her farther down the walk to better see the dock below. “Should we hide?” Mairi asked. Hide? Bloody hell no. He’d never hidden, even when his father sailed away when he was a lad or when his mother turned her back on him to go live another life on another island. He hadn’t hidden when Millie had chosen to live off island or when his first wife’s bloody body was brought over from Barra. “I can find ye a place to wait, tucked away,” he said. He shook his head. “Whoever has business on Kisimul has business with me.” Not to mention the fact that whoever it was kept calling his bloody name. “Then I stay by your side, husband,” she said, standing tall. “I’m just saying…” She met his gaze with her beautiful stubbornness. A stubbornness he wished she didn’t possess at the moment. “I’m not leaving your side.” She shook her head, chin firm. Damnation. Why had he come over here? Why had he brought her here? He toyed with the idea of locking her away in the kitchen building to meet his foes on his own, but after their history, the thought dissolved before it could take root. 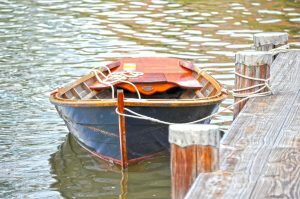 Huffing, he kissed her forehead and turned back to the dock, where the second rowboat sat. “Oh, bloody hell,” he whispered, feeling the falling of his stomach. “What?” Mairi asked, grabbing his arm with both hands. They both stared at the two row boats that seemed docked without ropes outside the walls of Kisimul. “Aye.” They both stared, and Alec’s heart pounded, his hand clenching the hilt of his useless sword. Mairi jumped, bumping into him. “What was that?” she said, her voice breathless. “Everything was burnt up in the great hall,” she said. She nodded, knowing better than he that they didn’t want to be caught in a burning keep. Taking her cool hand, they returned to the stairs that led into the castle. Alec took one last breath of fresh air, expecting smoke to already be filling the great hall. But as they descended, all was clear. The tang of ash had even lessened, as if a great wind had blown the stagnant air out of the great hall. Candlelight glow met them as they stopped at the bottom, frozen. 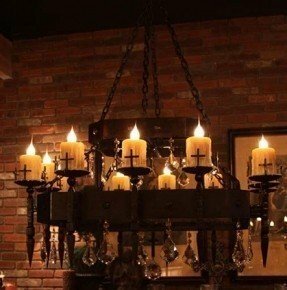 For there, sitting on the floor, as if someone had gently lowered it, the fragile candles with their flames intact, was the chandelier. “Did it fall?” Mairi whispered as they both stared. “It’s on the floor,” he stated the obvious. “We heard it fall,” she said. A breeze blew against the cracked door, and it swung inward. Alec pushed Mairi behind him and drew his sword. Wind flew through the room Alec couldn’t see for a heartbeat as Mairi’s hair wrapped up around them. “The candles,” Mairi called over it, capturing her wild tresses. Alec glanced quickly from the door to see the candle flames sitting perfectly still as if the room was shut up tight from drafts. Alec MacNeil. Chief of the MacNeils. Son of Alastair MacNeil. Wolf of Kisimul Castle. “I think it’s looking for YE,” Mairi said, grabbing tightly to his arm. Alec pressed her behind to block her with his body. She shivered against him as a chill rippled about them like a cold current in a warm ocean. He should have hidden her and the bairn away. But it was too late to move. The mist filling the courtyard beyond the open door began to solidify. Tall and broad, the familiar form made it difficult for Alec to inhale fully. 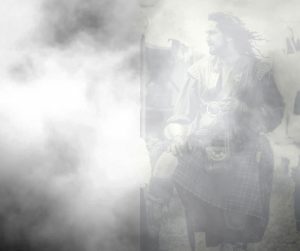 The warrior, in full MacNeil battle garb, walked within the mist and into the keep. The colors making up his form were muted, as if he was a faded tapestry come to life. The warrior’s voice could be heard, reverberating in the mist, yet his mouth did not move. Dark eyes stared out from the faded face. Squeezing hard to Alec’s arm, Mairi stepped out from his back. “Ye will not gouge out his eyes or his heart. I won’t allow it,” she yelled. The warrior’s face seemed to rearrange itself into a frown. Bloody hell, woman. Why would I gouge out his eyes and heart? He is my son. His father’s frown faded to be replaced by an open grin. I have returned to ye like I promised. As have I, came a woman’s familiar voice. From the mist engulfing the bailey walked another spirit, a woman wearing a wooden cross around her neck. She clutched it as she entered the keep. She nodded, a gentle smile on her lips. “Neither did I.” Alec stared at the form that seemed to waver in and out, not nearly as solid as his Da. “Why do ye come here?” he asked them both. For ye, his father’s voice filled the room. “Because I left Kisimul?” Alec asked. “I made him leave Kisimul,” Mairi said, throwing one arm before Alec as if to wedge herself between him and the ghosts. His father smiled, and the expression pulled at Alec’s memories. His father teaching him how to swing a sword, how to treat an injured dog, how to dance with a lass. The wounds of Alec’s heart ripped anew. He sucked in a ragged breath as guilt flooded him. “I chose to leave,” Alec admitted. He’d chosen Mairi and a happy family over remaining on a ruin. But the ruin was the seat of The MacNeil. His father nodded. Everyone leaves Kisimul. That is what we are here to tell ye. Behind the warrior another shape took form, a thin woman, coming forward without a word. Her colors were faded nearly to white, except for the bright red line across her throat. “Joyce?” His murdered, first wife moved on the mist to stand next to his mother. Joyce nodded, and sadness sat in the lines of her face. Joyce’s face seemed to fade and reappear, a smile replacing the sadness. With a nod to Mairi and then to Alec, the colors making up her form turned completely to white and gray and then dissolved into the mist that hovered in the room. “Ye did leave me,” Alec said, his guilt hardening in his gut until it became anger, the pain of loss heavy there. The woman did leave him, a sixteen year old lad, without any help in ruling his clan. She hovered closer. “My time has come to return to my God, but I sought ye first. Ye have grown strong and wise.” Her hand rose as if she reached out to him. Alec met it, feeling the cold mist that made up her form. The touch coursed through him as if he felt the last time she’d wrapped her arms around him. I love ye, son. The final words came on a whisper, and she faded away while he watched. The knots inside his chest loosened. “And I you,” he said. Behind his father, the mist began to clear in the courtyard. Alec laid his hand over hers. She was a solid anchor in the bizarre chaos around them. I remain, his father’s voice came even as his image faded. I have come so ye may leave, son. Everyone leaves Kisimul. I choose to stay. “Because I will not?” Alec asked, his voice growing louder as new guilt set in. Was his father condemned to spend an eternity here because of Alec’s choice? The pale colors in Alasdair MacNeil’s form brightened, and the lines of his face crisped into view again. His head shook slowly. Nay, son. Ye may come back or not, as will your children. The spirit’s gaze landed low on Mairi’s abdomen. But I will remain, the Wolf of Kisimul Castle. Ye are free. Make Kisimul a home, or a refuge, or an empty monument to our clan. ‘Tis your choice and the choice of those who follow ye. His gaze moved to Mairi again. Like your second daughter here. Mairi’s hand moved to her abdomen. “Our daughter,” she whispered. His image faded like day fades to night. Remember, son… The sound of his voice seemed to dissolve with the mist. We did not leave ye. We left Kisimul. And now I return for ye both. As the fog completely cleared, Alec’s inhaled deeply. The boulder, which sat in his chest, lightened, rolling away. His Da had returned, as did his mother. Even Joyce sought him out before journeying to wherever spirits go. He looked around the empty room, the chandelier still on the floor. “I’m shaking,” Mairi whispered, and he realized that his hands trembled. Alec breathed in the scent of love, his love, Mairi. Flowers mixed with her unique woman’s scent. It filled him with his inhale and surrounded him with his exhale, making his sleep peaceful and deep. He couldn’t remember ever feeling so calm before, so at rest. With a deep breath, Alec blinked open, realizing that they slept, not in their grand bed but on blankets on the roof-walk of Kisimul, under a rose-colored sky. “Mairi? Da?” Weylyn’s voice came from the steps. Mairi shot up, but then relaxed as she looked under the blanket. “I wasn’t sure if I had a stitch of clothes on,” she whispered. Alec kissed her and unfolded to stand. “Up here,” he called toward the door they’d left open to the corridor below. Both Weylyn and Cinnia ran up the steps. “We brought ye food and drink,” Cinnia called. “I hope ye aren’t angry,” Cinnia added, her face pinching. Alec wrapped both children into a hug. “Nay.” He looked to Mairi over their heads. She blinked as if tears threatened, but a smile curved her lips. “Ye saw through the mist?” Alec asked. “My Da’s boat,” Alec said, and heard Mairi gasp softly. Her hand squeezed his arm. Thank you so much for reading along! I felt that Alec needed some closure after THE WOLF OF KISIMUL CASTLE, and a meeting with the dead seemed perfect for this time of year. If you haven’t read the book yet, don’t worry, I avoided spoilers in this little ghost tale as best I could. I loved this where is the other pages. I liked the fact you continued from where the new house was built. When Alec told Mairi they would live on the mainland I was disappointed, I had hoped they would rebuild and now maybe they will.